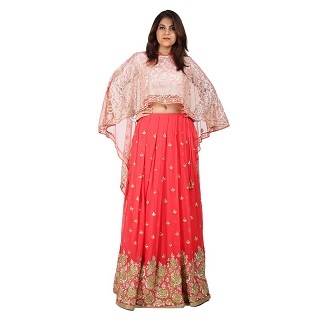 10 Gorgeous Lehengas That Won’t Show Too Much Tummy! Happy to wear backless blouses, but showing off your stomach makes you think twice… Or thrice?! Well, a lot of girls are a wee bit conscious about how their stomach will look in a lehenga. But the good news is, there are so many new and stylish lehenga styles that actually look better than the typical short choli and skirt. Check out these 10 gorgeous lehengas for all your shaadi functions, but, don’t you ever forget to embrace those curves. Featuring a blush pink peplum blouse with gold zardozi embroidery, sequins and beads, the lehenga set is as pretty as can be. Styled with a messy bun and delicate danglers, it’s sure to set you apart at the wedding reception. Price: Rs 38,500. Buy it here. Opt for a jacket instead of the choli. Not only was this style a rage at the recently concluded Couture Week, it really does add a lot of glam to the overall look. We love this jacket style top with colourful bird motifs. The playful design makes it the perfect fit for your mehendi. Price: Rs 3,749 (for rent). Rent it here. Cut out an elegant picture in this wine coloured raw silk outfit. It’s elegant and classy and the colour is just perfect for a winter wedding. Go bold with your lips, put on a pair of statement earrings and we’re sure you’ll cause a stir as you enter the venue. Price: Rs 34,200. Buy it here. 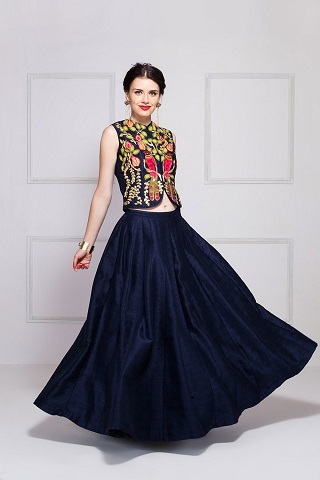 High-waist lehengas paired with crop tops look totally fun and fabulous! And we especially like this one for those pretty little gold and silver motifs. 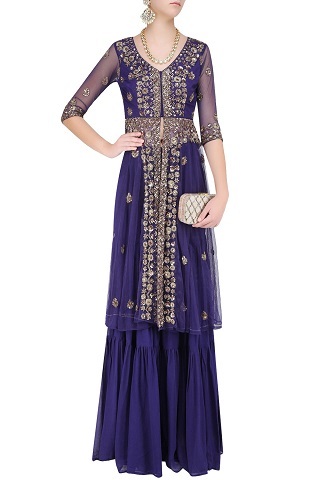 Fuss free and comfy, it’s just what you need to dance the night away at your sangeet! 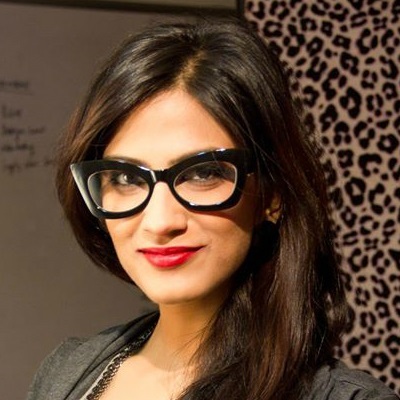 Price: Rs 15,000. Buy it here. Looking for something subtle for the roka ceremony? 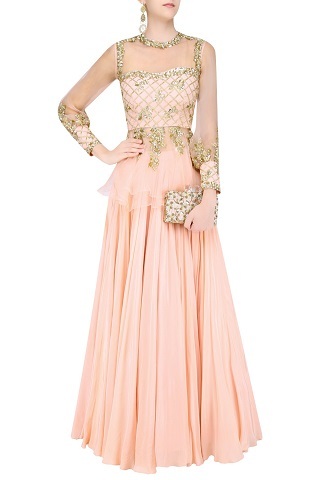 For us, this peach lehenga with a sheer jacket makes the cut. And yup, you can never go wrong with mirror work! Soft curls, light makeup and a statement ring will complete your look. Price: Rs 1,899 (for rent). Rent it here. Look like absolute royalty in this royal blue jacket set. The colour is a lot in vogue right now and we adore the overall delicate gold sequins - so stunning! For your sangeet night, tie your hair in a side juda and put on a pair of pretty juttis. Price: Rs 48,000. Buy it here. A fuschia set with resham embroidery. The front and back panels in this one, are great for a slimming effect. 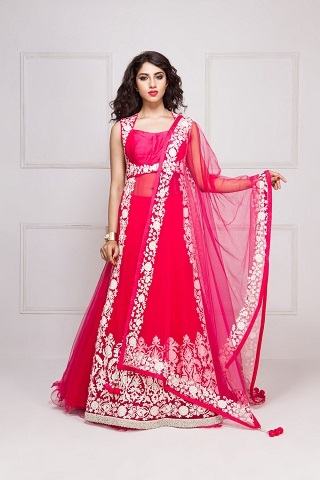 And what’s even cuter is the net lehenga with the ruffled hem. A great buy for your engagement, don’t you think? Price: Rs 2,499 (for rent). Rent it here. A unique and stylish concept, the ensemble features a pre-stitched and pre-draped blouse and dupatta. We love the floral print, the subtle colour and the sheer sleeves. The kalidaar sea green lehenga has a beautiful fall and is sure to flatter your figure. Price: Rs 45,800. Buy it here. 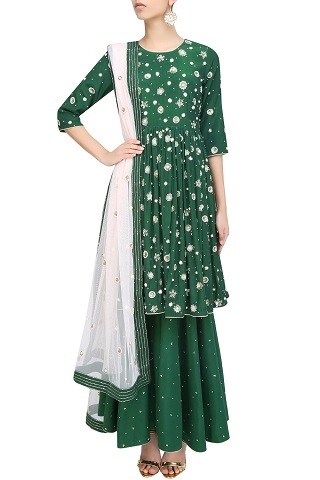 A short anarkali kurta paired with a lehenga or garara looks super stylish! And we even love the scattered booti work. A pair of heavy chaand baalis and strappy sandals is a great way to complete your look. Price: Rs 47,500. Buy it here. Capes are THE thing right now! And why not, they do look absolutely stunning! For the engagement or at the sangeet where you don’t want to be bothered with dupattas, a cape blouse is the way to go! Price: Rs 29,999. Buy it here. Which one do you like the best?